From a Madison Scouts press release: The Madison Scouts is excited to announce its 2007 design team. Madison Executive Director Jeff Spanos said: "The goal when we started the process of evaluating the 130-plus people who expressed interest in being involved was to find the best blend of proven Madison Scouts talent and bright new influences who will challenge us to improve. I am confident we have achieved our goal." 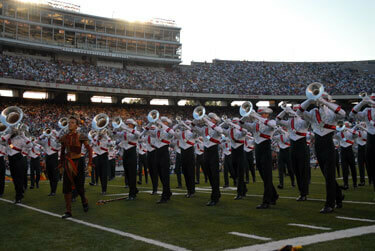 The Madison Scouts, seen here performing at the 2006 DCI World Championships, will be led by a brand new design team in 2007. The 2007 design team is led by program coordinator Matt Gregg, a college music professor at the University of Wisconsin-Platteville, where his primary responsibilities are conducting the symphony band and wind ensemble, as well as the marching band. A new brass arranger, front line arranger, color guard and creative consultant, percussion arranger, visual designer and creative consultant also have been named. Read more on www.madisonscouts.org.